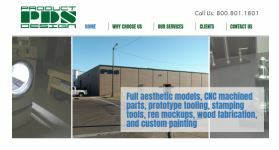 BENTON HARBOR, MICHIGAN, UNITED STATES, February 18, 2019 /EINPresswire.com/ -- Benton Harbor, MI; February 18, 2019 – Product Design Services, LLC (PDS) today announced the launch of an all new website highlighting the company’s capabilities and use of the latest advances in prototyping technology. PDS worked with the design team at Precept Partners in nearby Buchanan, Michigan to develop the new www.PDSllc.com website. With over 20 years of expertise, Product Design Services (PDS) is capable of a providing a wide range of prototyping services including full aesthetic models, CNC machined parts, prototype tooling, stamping tools, ren mock-ups, wood fabrication, and custom painting using the latest technologies and state-of-the-art equipment. PDS has a dedicated staff working full-time to ensure the highest quality results. As a result, PDS is the first choice for precision prototyping among leading manufacturers including Whirlpool, Intuitive Surgical, Raytheon, and many others. Contact PDS to discuss your prototyping needs. Details at www.PDSllc.com.